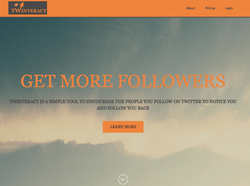 Twinteract is an application that helps people grow their twitter followers (and thus their social influence) by engaging with the people they follow that do not reciprocate. It subtly (read: not spammily) favourites tweets from the people who don't follow you back in order to encourage them to notice you. Hopefully you have set up your profile to be relevant to the people you follow and that will help them see that there is a connection. Also when they see that you favourited their tweet they will see that you are a followers of theirs which will also increase the chances that you follow them back. Sign up now @25€/month. Recaply was a month long content curation experiment. A digest of the daily tech(y) news. It was a news / interests site where I collated & shared interesting tech articles. Used it to test the Facebook Edge Rank algorithm & see if content curation / recycling sites were still doable on the back of a Facebook fan base. Result? Only about 1-2% of your Facebook fans are now seeing your posts organically. If you want to succeed with this model you need to focus on viral content. Work in progress! Currently learning via TeamTreehouse. Excellent & would highly recommend. 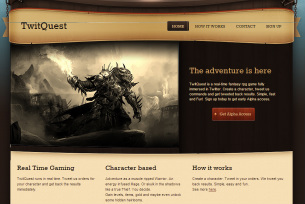 TwitQuest is a real-time fantasy rpg game fully immersed in Twitter. Create a character, tweet us commands and get back results. Simple, fast and Fun! Please do check out the website, like us on facebook and follow us on twitter. 'Tatch is a project I have been planning for a long time. The web is too fragmented, we spend too long moving from one site to another in order to check email, update twitter, check facebook etc. I am building a web app that will allow you to access all of your web services in one place. The aim is for it to be your 'home page'. When you open the browser you will be able to see, at a glance, whether you have emails waiting, twitter interactions, facebook comments or whatever it may be. Have plans for a few cool things like making it a two sided app (some publicly visible and some not) and the ability to just one click follow all of someone's social accounts. Currently in development so hoping to have something to test soon! This was a result of 54 hours work at Startup Weekend Dublin. Our team decided to make a video game. The theme was an angry office worker called Doug Mikeless - navigate your way through his career while trying to suppress his violent nature. You can read more about it on this blog post.